The inevitable occurred – and Rob Wolf, editor of Mopar Collector’s Guide, did a “Pinks” style start for the grudge match on the 1/4 mile drag strip at Las Vegas Speedway. SpeedFactory driver Eddie Rosa emerged victorious with a 1/4 time of 12.374 seconds at 112.66 mph, beating the CDC car by 4/10 of a second. The SpeedFactory Challenger has the Stage 3 supercharger package, featuring a Vortech Supercharger at 6.5 lbs boost, Hotchkis handling package, Magnaflow catback exhaust, and SpeedFactory Signature package. Installed options include Richmond 3.55 gears and Boze “Tach” style forged wheels. Everything else on the car is stock 2008 Dodge Challenger SRT8. As shown in the video, the Challenger was on street tires. 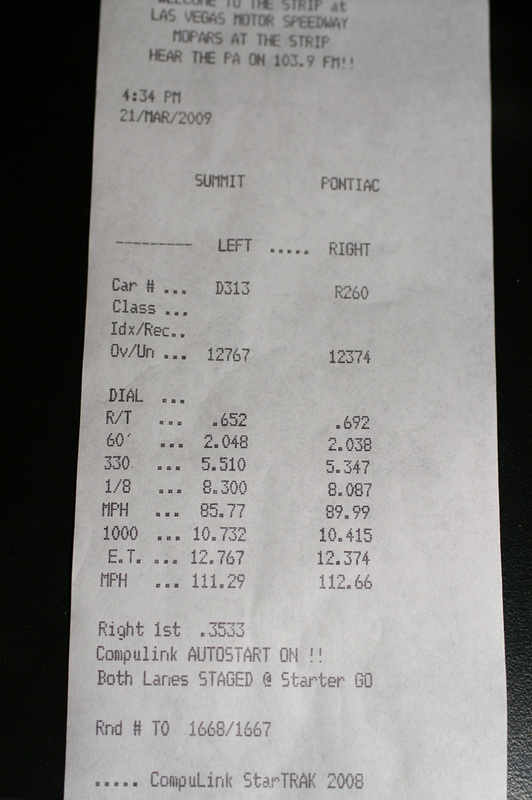 On drags, the SpeedFactory Challenger runs in the 11′s. Thanks to our partners at Vortech Superchargers, Magnaflow Performance Exhaust, Richmond Gear and Boze Forged Wheels. Timeslip - SpeedFactory Challenger was on the right/Pontiac side.